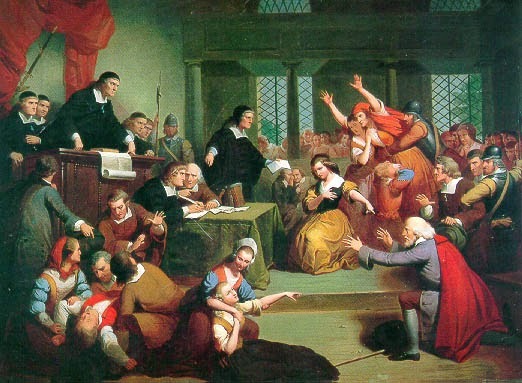 Original Court Records of the Salem Witch Trials are available online from a number of sources. "Salem Witch Trials: The Documentary Archive and Transcription Project,” provides access to 17th century Court Records and other primary source material, as well as transcriptions, historical maps, archival collections and scanned contemporary books. It is hosted by the University of Virginia, but the Project Staff is international. “Salem Witchcraft Trials:1692” is a website within University of Missouri-Kansas City School of Law Professor Douglas Linder’s “Famous Trials” website. This ambitious project includes primary source documents, biographical material, maps, images, a bibliography and a Jeopardy! Game. Witchcraft Collection, part of Cornell University Library’s Division of Rare and Manuscript Collections, contains over 3,000 titles documenting the history of the Inquisition and the persecution of witchcraft, primarily in Europe. The Primary Source Digital Witchcraft Collection includes material about the Salem Trials, as do the Student Research Papers available on the Witchcraft Collection website.